The Skinny: Violent, uber-depressing vision of an alternate universe Japan that smacks of Nazi Germany. Spectacular animation and sleek character designs make the film worth at least one viewing despite its bleak subject matter. 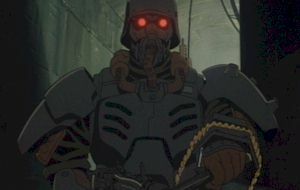 Review by Calvin McMillin: If any a film deserved the description of "grim and gritty," it's Jin-Roh: The Wolf Brigade, a depressingly bleak, yet powerful anime that takes place in an alternate universe in which the Japanese triumphed over the Allies in World War II. The film begins a decade later as Japan's oppressive regime is now locked in a fierce war with an equally violent terrorist/rebel group that has a fair share of teenage girls under its thrall. Nicknamed "Red Riding Hoods", these women serve as little more than suicide bombers. During the heat of battle, Constable Kazuki Fuse encounters one of these "Red Riding Hoods", but fails to shoot her before she detonates the bomb strapped to her person. Suspended for his failure and sentenced to mandatory re-education, Fuse bumps into the young girl's older sister, Kei, a virtual dead ringer for the deceased bomber. The two eventually embark on a kind of quasi-romance and soon find themselves caught up in a complex web of conspiracies involving the cops, the terrorists, and the Nazi-like Jin-Roh commando unit.